The Financial Accounting Standards Board (FASB) introduced a new accounting standard (ASU 2016-02) that requires companies to recognize operating lease assets and liabilities on the balance sheet. Our forensic accounting technology has applied this convention since inception, so all of our models and research already reflect and will continue to reflect this change. In other words, we have you covered. Note: The impact of this change is almost entirely around lessee accounting (companies that pay leases) and is the focus of this article. A company can lease assets in one of two ways: capital leases or operating leases. Capital leases effectively act as debt to own the underlying asset leased. A simple analogy is taking out a loan to purchase a car or home; payments are made periodically and, at the end of the term, the asset is owned outright with the loan repaid. Operating leases do not transfer ownership of the underlying asset, and payments are made for usage of the asset. A simple analogy here is leasing a car from a dealer; the lessee makes payments for the right to use the car, but does not gain equity in the car itself and will not own the car at the end of the lease. Prior to this new accounting standard, GAAP required the assets and liabilities associated with capital leases to be on a company’s balance sheet. Typically, these leases are in relation to property, plant and equipment (PP&E), so the capital lease assets were recorded in PP&E while the lease liabilities were recorded in debt or other liabilities. On the other hand, operating leases, both the assets and liabilities, were not reported on the balance sheet, despite the fact that entities were using the assets and contractually obligated to pay the lease. Also prior to this change, capital leases required separate depreciation and interest expenses, whereas operating leases required a lump-sum lease payment or rental expense. A summary of historical accounting is shown in Figure 1, below. The single largest change in FASB’s ASU 2016-02 is the requirement of operating leases to have the associated asset and liability recorded on the balance sheet at the present value of future lease payments. 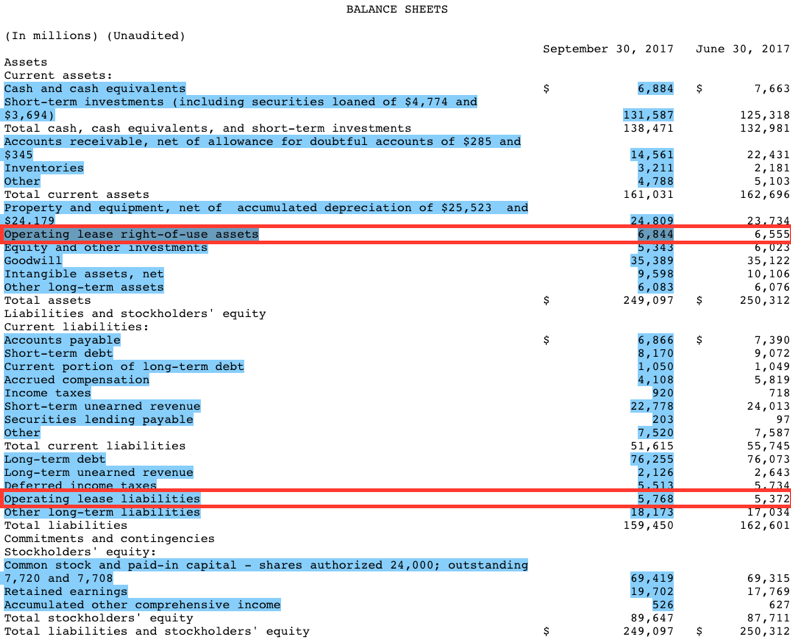 These large assets and liabilities, once hidden in the notes, will now be placed directly on the balance sheet, and we applaud FASB for requiring more transparency for investors in public equities. The new standard still requires just one lease/rental expense reported. However, because assets are now recognized, impairments will also be recognized on the income statement, outside of this single lease cost. Despite being off-balance sheet assets and liabilities, we have always included the effects of operating leases in its models. On the balance sheet side, we added the present value of the future minimum lease payments, discounted by a consistent cost of debt, to our measures of Invested Capital and Operating Debt. This methodology is virtually identical to the new treatment required by FASB. On the income statement, we subtracted an estimated interest cost component from operating expenses in our calculation of NOPAT. Because operating lease expenses are recorded as a lump-sum, we need to remove the financing component as a non-operating expense, as we do with other financing costs. Finally, along with other forms of debt, the operating lease liability is subtracted from Enterprise Value to arrive at Shareholder Value. More details are in the white papers on our treatment of off-balance sheet debt. After this accounting rule change goes into effect, we will continue to calculate operating lease liabilities and expenses as we always have. Given the likely variances in how companies will calculate their operating lease debt, we will remove what they report the on-balance sheet and replace it with our calculated value. Our values will provide far greater comparability for all companies with operating leases as well as for the year-over-year results of individual companies. 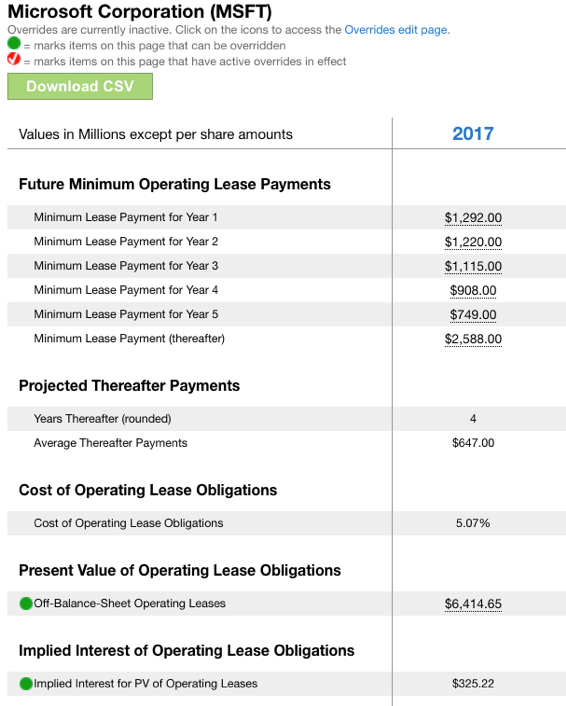 When operating lease costs are reported as a lump-sum item, as shown in Figure 3, above, New Constructs will continue to remove an estimated interest expense for operating leases from operating expenses. In the event companies disclose the interest expense portion of the operating lease expense, we will consider that value as a replacement for our estimated values. There will be no material change to our models as a result of this accounting update since we have always included the effects of these off-balance sheet liabilities when calculating ROIC, invested capital, NOPAT and Shareholder Value. There will, however, be a change in the reported total assets and liabilities of public companies. Although the change is not slated to be required until the 2019 calendar-year, a few companies have early-adopted, e.g. Microsoft (MSFT). Figure 4, below, was taken from Microsoft’s first quarter filing of its current fiscal year. Microsoft reports operating lease assets of $6,844 million in Q1 under FASB’s new disclosure requirements. Per Figure 5, below, this compares to the $6,417 million we calculate and include in invested capital for Microsoft’s fiscal 2017 (there is no disclosure in the Q1 filing for year-end value of operating lease assets). 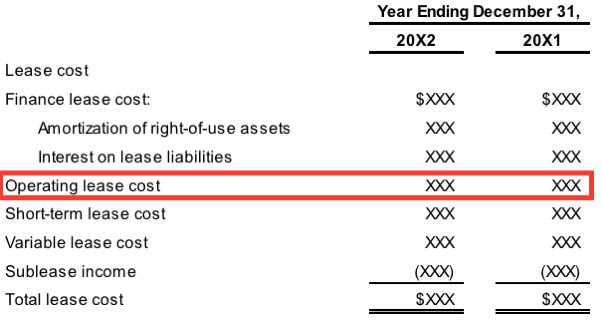 Note also in Figure 5, the non-operating implied interest expense of $325 million that will be excluded in the calculation of Microsoft’s 2017 NOPAT. Microsoft’s operating lease liability is small relative to its total assets, which is likely why the company chose to early-adopt this new rule. Accordingly, we expect several other companies with relatively small operating lease liabilities may also early-adopt. However, for those where the operating lease liability/asset is relatively large, we do not expect early adoption, and we do expect significant disruption to analysts’ models that have not already accounted for operating leases prior to the requirement of adoption of the new rule. Figure 6 highlights companies that have large operating lease liabilities relative to their reported assets. In other words, these companies are likely to hold off on adopting the new standard to preserve any benefits gained from not disclosing the liability. Town Sports International Holdings Inc. (CLUB $8.15/share), for instance, will see their reported assets increase by ~224% or more than triple. Figures 7 and 8 show that many major companies will experience significant changes to their balance sheets because of this accounting rule change. Any investor using traditional metrics such as ‘Return on Assets’ will see sudden, large changes that misleadingly suggest changes in the underlying business when there are only changes in the accounting for that business. We strive to be at the forefront of accounting standards changes. We prepare for months in advance of changes to ensure our models remain the best in the business. When meaningful rule changes are announced, we update our calculations and models to maintain as much historical comparability as possible while also accurately reflecting the true economics of the business. Regardless of whether companies adopt rules early, late or on time, our models will be consistent year-over-year. Classify repayments of the principal portion of the lease liability within financing activities and payments of interest on the lease liability and variable lease payments within operating activities in the statement of cash flows.